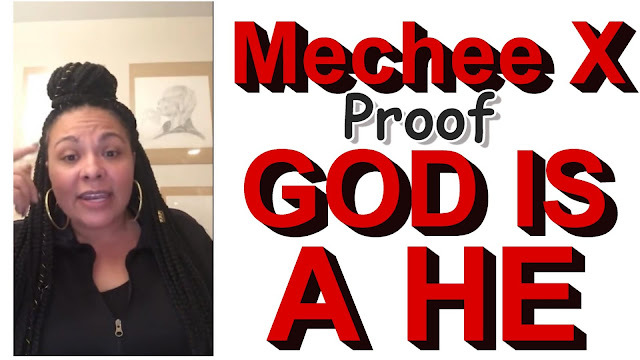 Rise Up and Come Out Church: GOD IS A HE: Pastor Cinque vs Female ex pastor named Mechee X who doesn't believe in the Bible anymore and now fully engaged in Voodoo Worship!! GOD IS A HE: Pastor Cinque vs Female ex pastor named Mechee X who doesn't believe in the Bible anymore and now fully engaged in Voodoo Worship!! Pastor Cinque breaks down the weakness in the Church, and the White Supremacist Ideology of Christian Churches that is making hordes of young Blacks and Minorities run away from the faith in general. They don't even want to be Hebrew Israelites, because the Church with their White Supremacy has disgusted the youth from the faith. Earth to Ariana Grande. GOD IS A NOT A WOMAN!! Mechee X, an ex pastor is now part of African Spirituality, which is not what we Israelites are about. She brings up the age old question on whether or not God is a Man or a Woman, but let's see what the Bible says (There are hundreds of Scriptures showing God's Gender, but we will only show you a few). WOMEN SILENCE IN CHURCH- Women can only be Pastors and Ministers to Women and Children and not in a Church. THERE WILL BE NO SUCH THING AS BLACK LOVE, OR ANY KIND OF LOVE UNTIL THE WOMAN SUBMITS TO A GODLY MAN. That goes for Actual Women in relationships (Polygyny), as well as the Church (re-organization). 4 And in that day seven women shall take hold of one man, saying, We will eat our own bread, and wear our own apparel: only let us be called by thy name, to take away our reproach. Today, the churches are all loaded up with Female Pastors who won't submit under a man, but this is spiritual. In the future, even they will submit under a man. 7 or more of them at a time will come to a godly man, bring him in and say "run this church." The Black Man- A Godly one= IS GOD (god) Over the Woman, Children, and Society. This goes for any man, but we are using this as an example, because among Blacks the BLACK WOMAN IS GOD! MOST AFRICAN SPIRITUALITY IS WOMAN WORSHIP, MOTHER WORSHIP ETC... Sounds a lot like Ishtar (Easter) worship, and Ashtoreth worship to us. THEREFORE, UNDER PROPER BIBLICAL GENDER ROLES- YES, THE BLACK MAN IS GOD!! Mechee X, is so disgusted from the Bible she has now joined into Voodoo, called Vodun. Voodoo Worship will make things today even worse for our people!! Of course we all know this as "Jacob's Trouble!" GOD WILL DEMAND A POPULATION REDUCTION OF 2/3RDS AS OUR PEOPLE CONTINUE TO WALLOW IN THE MIRE. Thou shalt burn with fire a third part in the midst of the city, when the days of the siege are fulfilled: and thou shalt take a third part, and smite about it with a knife: and a third part thou shalt scatter in the wind; and I will draw out a sword after them. When will we be truly free? XXVIII. And I answered and said: “O Mighty, [Eternal One],17 hallowed by Thy power! Be favourable to my petition, [for for this h ast Th ou b rought me up here—and shew me]. as I ask—whether what I saw shall happen to them for long? what thou hast come to know. So we know that God is not a liar and he doesn't change. Therefore, he's not a Woman. Also, God is not some "Old White Guy" who hates Blacks and Non-White People. Like it says in Deuteronomy 28. This is chastening our people- a form of discipline. Our struggle has also been to refine us like gold and silver is refined. Racism is the main motivator for Blacks, Latinos, Native Americans, etc.. to fall away from the truth of the Bible. This is why for years I have been fighting Racism and injustice, because I knew that Racism and Injustice are the kind of Iniquity that would make the heart of many grow cold. When the love grows cold guess what? When the Iniquity is abound guess what? When the Injustice makes people furious guess what? And what does Sin do? And this is one of many reasons why we are Social Justice Israelites!! WHY DID GOD SHUT THE GOVERNMENT DOWN?